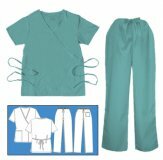 These sets include a srub mock wrap top that ties in front or back. It has set in sleeves, two lower pockets and side slits. 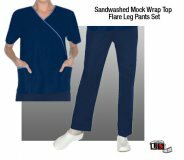 A low rise flare leg pant with drawstring front, back elastic waist, two side pockets and side slits on bottom of pant leg complement this set.